Abstract: Colorectal cancer (CRC) remains a formidable health burden worldwide, with up to 50% of patients developing metastases during the course of their disease. This group of CRC patients, characterized by the worst prognosis, has been extensively investigated to improve their life expectancy. 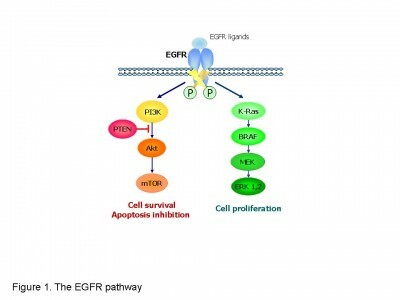 Main efforts, focused on the epidermal growth-factor receptor (EGFR), which plays a pivotal role in CRC pathogenesis, have led to the development and introduction in clinical practice of specific targeted therapies (ie, monoclonal antibodies). Subsequently, the scientific community has tried to identify molecular predictors of the efficacy of such therapies. However, it has become clear that EGFR alterations occurring in CRC are difficult to investigate, and therefore their predictive role is unclear. In contrast, the clinical role of two downstream members (KRAS and NRAS) has been clearly demonstrated. Currently, EGFR-targeted therapies can be administered only to patients with wild-type KRAS and NRAS genes. Our review addresses the medical management of metastatic CRC. Specifically, we describe in detail the molecular biology of metastatic CRC, focusing on the EGFR signaling pathway, and we discuss the role of current and emerging related biomarkers and therapies in this field. We also summarize the clinical evidence regarding anti-EGFR monoclonal antibodies and examine potential future perspectives.